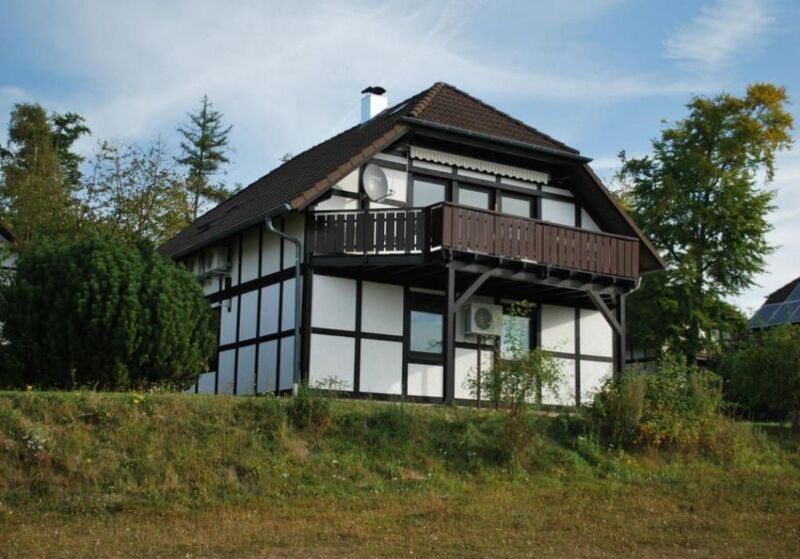 The houses are located in the beautiful Holidaypark Frankenau, just 1 km from the small town Frankenau. The park exists of a large amount of holiday houses, located on beautifull places, located a little bit higher with a great view on the Park and the valley of Frankenau. In the Park is a playground for the children, natural small pool where you can navigate in a rubberboat. In the small town you find nice shops for the daily shoppings, normally the guests go to the bigger town Frankenau for the bigger shoppings, about 14 km from the Park. The bakery in Frankenau in the opposite of Edeka has a fresh-bread service, every morning he delivers the ordered bread in the Park at your front-door of the houses. The houses form together one big house in the original style of the area, both with a separate entrance, the entrance to the house Am Sternberg 209 is a footbridge from the road to the front-door, the house Am Sternberg 211 can be reached from the road through a stone staircase and a path to the front-door. Am Sternberg 211 can use the terrace and the garden on the left side. Am Sternberg 209 has a big balcony on the east and on the south, the tenants can use the garden on the right side. The garden lies next to the large, free common playgrounds, the children can play their with the ball, play with fly kites, play with the sledge during the wintertime. On a distance of 100 meter you can find the entrance for free to the National Park Kellerwald-Edersee. In the National Park, with 60 km2, you can find the rare and impressive trees protected by UNESCO, here you can expect great walkingtours. Next to the short and longer walks, there is also een long distance walkingtour in the area. The Park is also an ideal location for mountainbike-trips. This apartment (ground floor) is equipped for a stay of max. 6 people. It is possible to place a nursery or cot for small children in the bedrooms. The interior of the house consists of a large living room in L shape with kitchen, dining and sitting area, fully furnished with the necessary furniture. The two bedrooms are furnished with proper box-spring beds. With more than 4 adults up to 2 people can use the (high-quality) sofa bed in the living room. The bathroom is equipped with shower and toilet, the kitchen is fully equipped and equipped with a microwave and a hood. The heating is a new air-air heating system with heat pump, a complete air conditioning system that can be cooled in the summer if desired. In the house is also an atmospheric and good quality wood stove installed. In addition to the T.V., DVD and the radio-CD player, there is a bookcase with books in the living room, a folder with folders and suggestions for leisure activities in the immediate vicinity and further away. Of course you can also use the large terrace and the garden (for the ground floor this is the left side of the garden). The National Park Kellerwald–Edersee lies on the northside of the biggest waterreservoir of Germany, the Edersee. Here you can find a lot of watersportpossibilities like rowing, diving, swimming, sailing, surfing, boattours on the lake. Nearby the reservoir is an interesting museum about the history of the waterreservoir, like the destroyment of the dam during the second world war. Nearby the Edersee is a toboggan run for the summer and a corn labyrinth. In the beautifull area of Frankenau with hills and forests, you can find typical villages with nice sights. Louisendorf is famous because of the history, about the Huguenots who were thrown out France ages ago. During the wintertime you can celebrate great wintersport holidays, in places like Winterberg, Züschen, Willingen. Cross-walking is also possible in the same places, even as nearby Frankenau. Frankenau is located in a region with many golf-courses. The management of the bigger and smaller golf-courses are willing to invite you on the courses on the most beautifull locations. In Löhlbach you can find a nice outdoor swimmingpool, the covered tropical swimming paradise Helioponthe in Bad Wildungen is very popular, especially during the lower seasons. In this region you can find a lot of cultural and historical attractive cities like Marburg, Bad Wildungen, Fritzlar, Frankenau, Korbach, Waldeck en Bad Arolsen. You can visit a mine in Bergfreiheit where half-gemstones were digged out for years and years. You can visit a museum in Korbach about goldmines and digging gold. In the monastery Haina you can visit a museum, they inform you about the history of the region. In every city they organized year by year cultural events, you can find here a lot of museums. During the holidays they organize activities and festivities for the tourist and inhabitants of the region.